I absolutely love this recipe as it can be adapted to use up almost any vegetable in the kitchen: instead of using bok choy, sugar snap peas could be used or green beans, cabbage, spinach or broccoli. Prawns instead of chicken. Make it a little more ‘tangy’ by adding some crushed chilli flakes or a little more Sriracha. The noodles could be fresh or dried – egg or ramen or even spiralized vegetables. The list is endless. This is a quick 20 minute recipe which can be cooked in just one pan. Leftovers will keep perfectly in the fridge and will quickly stir-fry for another meal. Cooking the chicken thighs underneath the weight of a large pan stops them spitting, but also produces the wonderful crispy skin which adds so much to the flavour. 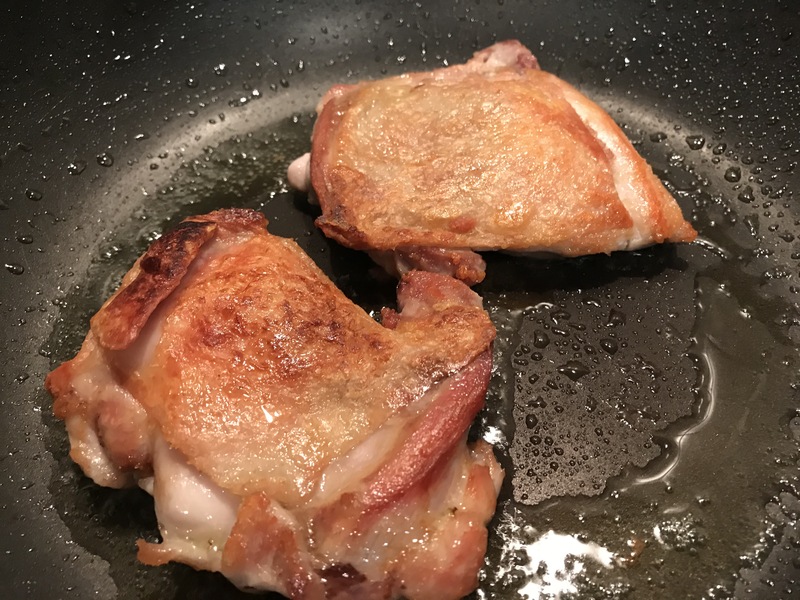 Heat 1 tablespoon of olive oil in a large wok or fry pan and place the chicken thighs, skin side down in the pan. Cover with a sheet of baking parchment and rest a heavy saucepan on top of them. Leave on a medium/high heat for three to four minutes or until the skin is browned and crispy. Turn over and continue cooking until done. Remove from pan; allow to sit for a few minutes then cut into slices with a sharp knife. Leave to one side. Make the sauce by whisking all the ingredients together. If the sauce seems a little thick, add a dash of water. Add the chopped garlic and grated ginger to the fat in the pan and saute for about 1 minute. 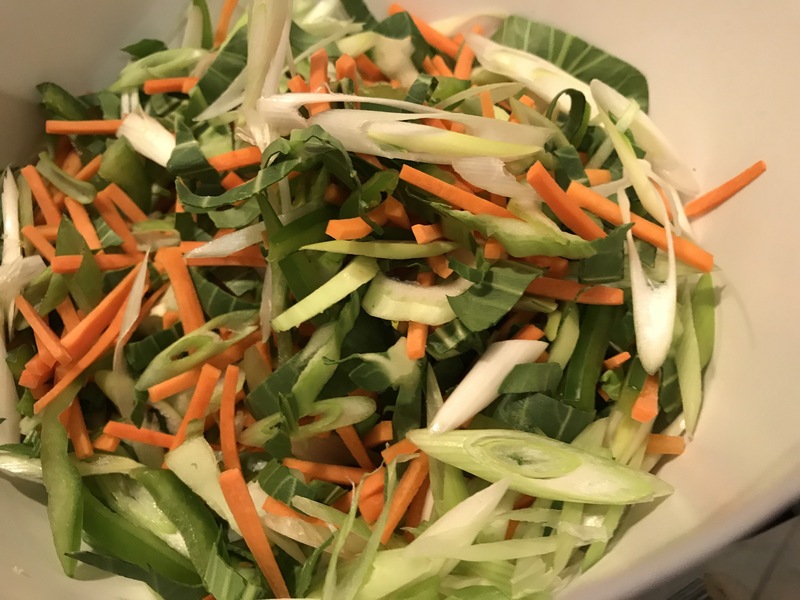 Add the bok choy, carrot sticks, green pepper and onions and cook, tossing frequently, for 1 to 2 minutes until lightly cooked but still crispy. Season then add the noodles and beansprouts and toss well. Pour the sauce over the vegetables and add the chicken. Toss well for another minute until heated through and the sauce is mixed in well. Pile into bowls and top with toasted sesame seeds. Ring the changes with shredded beef, prawns or meat of choice. Make this a vegetarian meal by using just vegetables. 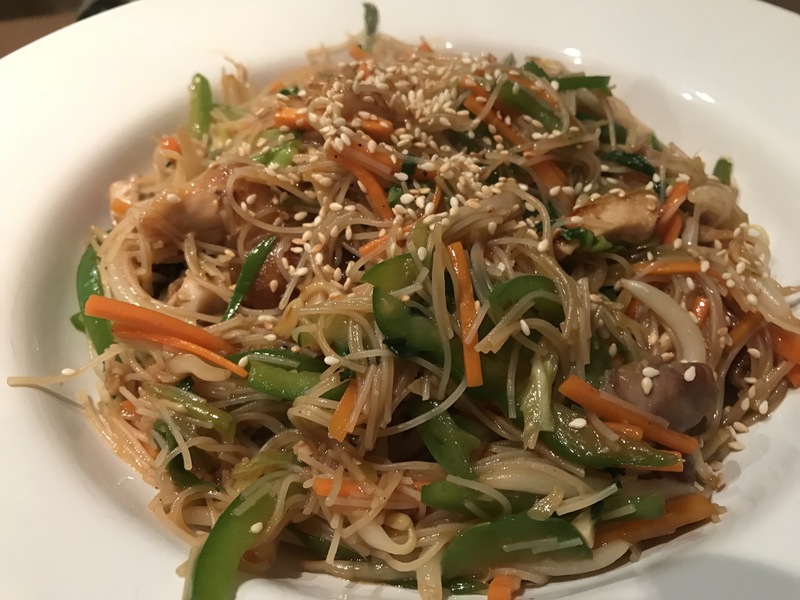 This entry was posted in Dinner, Supper and tagged Carrots, Chicken, Chow Mein, Cooking, Dinner, Garlic, Ginger, Gluten Free, Healthy Eating, Lunch, Onions, Peppers, Supper, Vegetables, Wheat-Free. Bookmark the permalink.